The Keokuk, Iowa press reports that a beef shortage is predicted. A Chicago food adminstration bureaucrat is accused of colluding to set prices for the cattle feeders. The meatless days campaging has succeeded in reducing beef consumoption by 30%. President Wilson has sent a letter of support yo the Bolsheviks encouraging them to continue to resist the Germans. 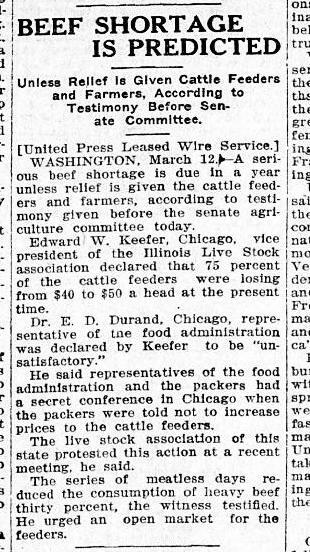 Source: "Beef Shortage is Predicted," The Daily Gate and Constitution Democrat, Kokuk, Iowa, March 12, 1918. Page 1, Column 3.